A Breakthrough in Barrel-Bashing Technology! 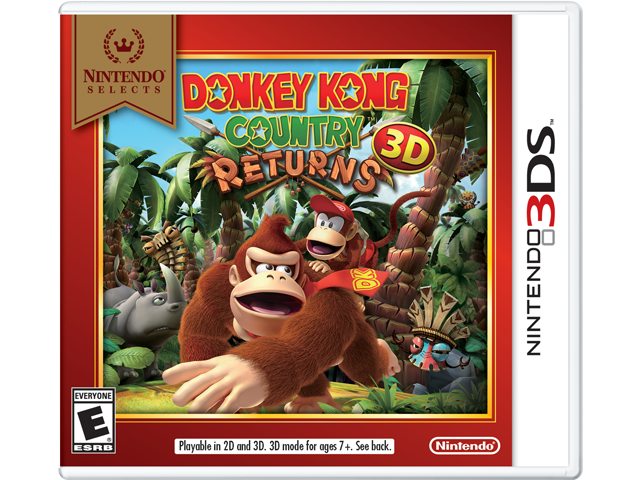 Donkey Kong Country™ Returns 3D brings you more than 70 challenging levels of ground-pounding, barrel-rolling action, and now it comes to life with stunning 3D visuals for the Nintendo 3DS™ system. The original Donkey Kong Country Returns game has been rebuilt from the ground up for ease-of-play on Nintendo 3DS, and features local wireless multiplayer* to share the excitement with your friends, plus an un-lockable ninth world with new collectible items and eight exciting new levels! Jump into the game in New Mode, enjoy the new ease-of-play enhancements, and find new items to help you during the game. Or, play the game in its Original Mode, featuring the challenge of the original Wii™ version gameplay. Either way you play, you'll get to rail ride, barrel roll, and swing your way through lush, layered 3D visuals in more than 70 levels of banana-hoarding mayhem. Share your adventure by playing cooperatively with a friend via local wireless*, and help each other get past tough spots as you search for lost bananas, puzzle pieces, and hidden secrets. Each level offers tricky challenges, so work together to recover Donkey Kong's beloved banana hoard! *Additional systems and copies of the game are required for multiplayer mode. Sold separately.